STUNNING KITCHEN AND BATH TOTAL RENOVATION COMPLETED! GORGEOUS NEW HIGH END CABINETS WITH UPSCALE GRANITE AND NEW APPLIANCES. ENTIRE UNIT FRESHLY PAINTED! CALL NOW TO BOOK THIS BEAUTIFUL 5TH FLOOR UNIT !! READ THE 43 FIVE STAR GUEST REVIEWS!! You won’t find many resorts with this much beach front....1300ft of sugar sands and emerald waters!! 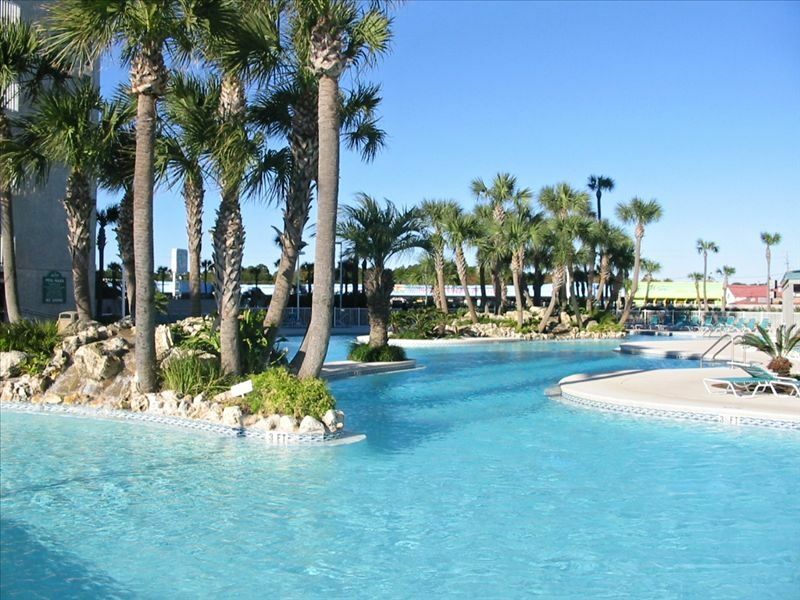 The huge Lagoon pool has tropical islands with waterfalls to soothe your cares away while basking in the sun on the Gulf of Mexico. Two seasonally heated Polynesian pools are gulf front as well as the 3 large hot tubs. If you desire to keep up with your workout schedule, Longbeach has a great new fitness center on ground level, enjoying a fab view of the gulf while staying fit. Enjoy a sandwich or drink at the 'Hangout' conveniently located poolside. Park your car right in front of the building in the private lot and you don't have to walk forever from a parking garage to your suite. Don’t worry, this resort is gated with 24 hr security. This beachy and colorfully decorated one bedroom, one bath condo on the 5th floor has everything you need to make this your paradise vacation. Browse 49 HIGHLY RATED reviews. Living room and master bedroom are both on the gulf with balcony access!! You have a fabulous view of the gulf from everywhere in the unit!!! My linens are commercially laundered and sanitized. Very important features to me as I'm sure it is to you! Bath linens are above average in quality with nice plush towels. Master is larger than most, so roomy with a King bed and NEW high quality very comfy bedding for a relaxing night after a long day at the beach. The sliding glass doors to the balcony, expanding the entire length of the room, will provide a calming gulf view upon awaking. New 32" LED TV and a DVD player for your enjoyment. A BRAND NEW 4K 50” SMART TV along with new BluRay in the living room. Recently added the highest quality cable, with 5 HBO channels and of course WIFI. The living room sofa sleeper is NEW and beautiful with matching Loveseat as well. Sleeper has a Queen mattress for comfort. It is the greatest one bedroom floor plan on the beach with gulf front living room and bedroom. The full kitchen was newly renovated with NEW HIGH END CABINETS, NEW gorgeous granite in the kitchen and bar area, fridge, stove and dishwasher. Also, dining table with 2 chairs and breakfast bar with 2 NEW tropical look bar stools. The newly renovated spacious bath has a marble garden tub with shower, separate from the gorgeous dressing area's NEW beautiful granite with NEW double vanity. The washer/dryer closet is appropriately away from the living area. We choose beautiful porcelain floor tile throughout the entire unit. Restaurants are within walking distance and the new 112 acre Pier Park is only 5 miles away on Front Beach Rd and is fabulous with plenty of dining, shopping and entertainment. You'll find everything there for the entire family and about 100 stores are now open! It's Grand!! But don't pay the higher condo prices at that end of the beach...stay at the beautiful LongBeach resort just minutes away and have more shopping money! Just catch the Pier Park Trolley generally running every 30 minutes in season....How fun is that!! The furnished bowed balcony is larger than average with plenty of room for dining and lounging. The sunsets from the balcony are spectacular. Free WiFi in the unit! LongBeach is family friendly so bring the kids! You'll have precious memories of your stay at Longbeach. Minimum age of 25 is required to rent our home at the beach and must occupy for the entire stay. The resort is monitored for violation and when found, eviction will occur at once, along with losing the remainder of your paid stay and your deposit. No Smoking including the balcony. We live in the Cincinnati area and less than 800 miles from the Worlds Most Beautiful Beaches. I fell in love with PCB the first time there with friends in '87. On the second trip there in '88 we bought our first condo and have spent every vacation at PCB since!! Convenient to shopping and dining, that is if you ever choose to leave this special place on the beach. PARK RIGHT IN FRONT OF THE BUILDING, NO PARKING GARAGE ACROSS THE STREET TO DEAL WITH. NEW, BEACHFRONT WOW! FREE TO GUESTS. INCLUDING COOKWARE, COFFEE POT, BLENDER, TOASTER AND EVERYTHING YOU’LL NEED TO COOK. (3) Lagoon pool, 2 Polynesian, 1 Seasonally Heated!! 3, ONE AT EACH POOL. Very much enjoyed our stay at Long Beach. The unit was well cared for and Nora was very responsive to any questions. The beach was beautiful. Everything about this condo was perfect! You are steps away from the beach. The condo was super clean, beds were comfortable and the condo has a bar and grill at the pool which was super convienant for our family. Heated pool was a plus too! We enjoyed our stay very much. Met a lot of "snow birds" and became friends with them. however, didn't feel enough effort was made to put out enough chairs for everyone at the pool. The pool was heated which was nice. The maintenance people were helpful. The condo was clean and nicely decorated. Clean....fantastic view....the perfect place to stay!!!!! Lenora was super responsive and took great care of us when we had to evacuate because of hurricane Michael. We will definitely be going back. We've been renting places from VRBO for years and this place is great. It's just as described and Lenora was great! We definitely will be renting this exact place again. It made our trip just perfect. Perfect location! Very clean and comfortable! My family and I absolutely loved this place! Very convenient and clean! We will definitely be back! About 5 minutes to the New Fabulous Pier Park shopping, dining and entertainment experience! 100 stores now open! Rates are subject to change until confirmed by owner, Lenora Payne. House rules: NO PETS OR SMOKING INCLUDING THE BALCONY. Singles under 25 must be accompanied by parent or legal guardian for duration of stay. I, Lenora (Nora) Payne, am the owner/manager of this property Please do not get involved with someone else claiming to own or manage #192053. It could likely be a SCAM. VRBO would always be helpful in verification if you have any doubts so don't hesitant to contact them.